Our fashionable collection of Labradorite Beads comprises of labradorite beaded jewelry and labradorite healing malas. Labradorite is famous for its unique properties like it turns gold and green and sea blue into bright light from dark green or grey color if viewed in dim light. The clarity ranges from opaque to hazy translucent. Our labradorite necklaces and bracelets are highly demanded. 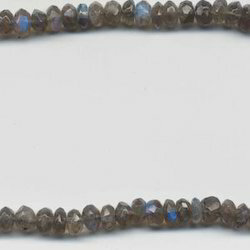 Looking for Labradorite Beads ?